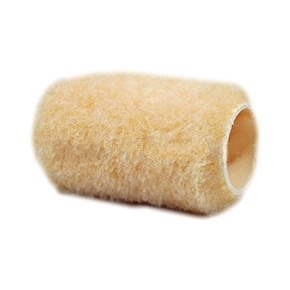 4-inch Wide Paint Roller Cover with 3/8 inch Nap. 1-1/2 inch ID Solvent Resistant Epoxy Core. Fits all standard roller frames. Price/Each. A high-quality reuseable paint roller cover. Suitable for all types of paints and coatings. Very low shed. Solvent Resistant: Yes to most solvent types. Sizes: 3, 4, 7, 9, 18. Naps: 1/4, 3/8, 1/2, 3/4, 1, 1-1/4, 1-1/2"
4-inch Wide Paint Roller Cover with 3/8 inch Nap. 1-1/2 inch ID Solvent Resistant Epoxy Core. Fits all standard roller frames. 48/Case. Price/Case.